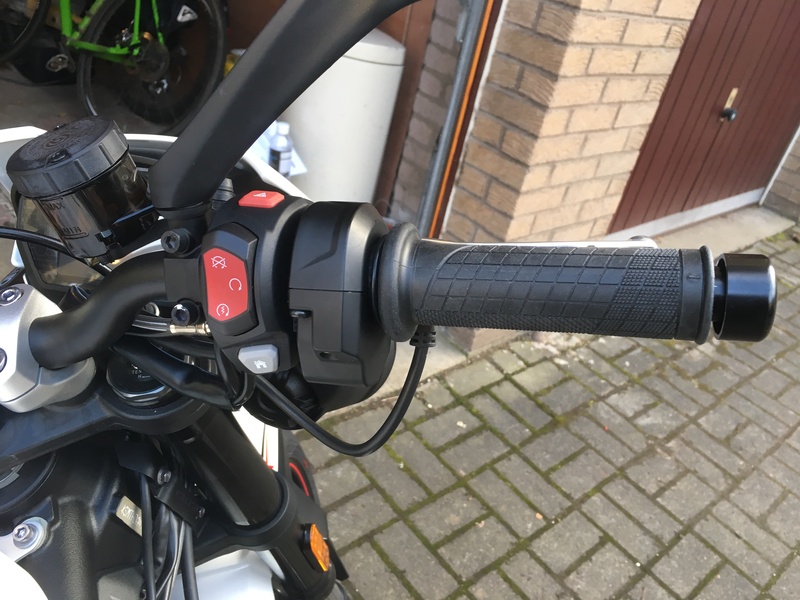 Since its quite involved to fit Oxford grips (or any other after market grips), I thought I'd post up whats involved incase anyone else wants to do this, or would like to make use of the accessory or heated grip electrical connectors on the bike. Oxford grips comes in several different types; sport, touring & adventure. The touring ones are the ones to get as they are the correct length out of the box, the sport one are slightly longer and would probably fit OK too but you might have to trim a couple of mm of the ends. The left grip is easy to fit - remove the bar end, then remove the two screws that secure the original grip, slide it off and replace with Oxford one. Test fit it before applying the super glue! The right hand grip is a nightmare. Remove the bar end, then undo the two screws that fix the throttle grip to the bars (remove the two larger cross head screws, not the slightly smaller anti-tamper screws), remove top cover then slide the throttle tube and grip off. Now you need to remove the rubber grip from the plastic throttle tube which is really hard work. It took me about 2.5 hours of cutting, scraping and pulling to get the rubber off. Next you need to cut all raised plastic bits off the throttle tube with a sharp knife, then you need to sand down the throttle tube to reduce its diameter so that the Oxford grip will slide over it fairly easily. I used a multitool with a rough sanding attachment to sand it down, followed by a bit of smoothing with fine sand paper which took another 1.5 - 2 hours. If you are feeling brave, an angle grinder might be quicker but is probably too fierce... When the grip fits comfortably over the throttle tube, refit the throttle tube to the bike and work out the best orientation for the grip so that the cable isn't in the way, then glue the grip to the throttle tube with superglue. Connect direct to the battery - easy. Connect to the accessory socket connector on the wiring loom, this circuit is permanently live and is fed from the 10A accessory fuse in the fuse box. The connector is located under the airbox on the left hand side, possibly hidden behind other wires - it is intended for supplying the Triumph DIN accessory socket (P/N A9828027). Since I was also fitting the accessory socket anyway, I decided to power the grips from the accessory circuit too and tapped in to the wiring loom from the accessory socket kit. Connect to the ignition switched supply intended for the factory fit grips - this is a three pin sumitomo connector which comes off the left hand side of the main wiring loom at the side of the airbox. The black wire is ground, red wire is positive feed from the instrument panel, and white is used to select the heat level (short to ground to cycle through the heat settings). If you want to use this supply for Oxford grips (or anything else), you will need a way of turning on the supply after the ignition is turned on e.g. some sort of press button to short the white wire to ground like the heat select button on the Triumph grips does. On the hottest setting the output on the red wire is 12V DC but on the lower two heat settings it is pulsed DC, so is unlikely to be usable for anything except the triumph grips. My install took ages but went OK apart from the left hand grip ending up a few mm too far up the handle bars (damn super glue set before I noticed), and the grips work really well. As a money saving exercise, it really isn't worth fitting the grips yourself - either pay the extra for the Triumph grips if they are warm enough for you, or get the Oxfords if you want guaranteed toasty digits and pay the dealer to fit them (my dealer wanted £60 to fit the Oxfords which is a bargain for the work involved) unless you really, really want to DIY. Oh, and if you wan't an accessory socket for powering stuff, then I'd recommend the Triumph kit (P/N A9828027, £25) as it is a neat solution. Its a DIN type socket rather than than the fag lighter type. Its not difficult to fit but is a bit involved because you need to remove the tank and airbox etc. jannerman and davewho like this. Thanks @goosander , an excellent write up, unfortunately, I've already fitted genuine Triumph grips. Pro's: Fully integrated, clean unobtrusive installation & really easy to fit. Cons: Not particularly hot, even on the highest setting (which is presumably what most people want them for) + they're ****ing expensive! If I hadn't, I'd seriously consider doing as you've done, also I wasn't aware of the genuine Triumph accessory socket you mentioned, I looked up the installation instructions and it looks like a really neat installation, if a little pricy for what it is. So, a BIG THANKS for that. P.S. Any chance of some pictures of you installed grips and controller, so others can compare with the Triumph ones? Last edited by jannerman; 04-14-2018 at 07:47 AM. 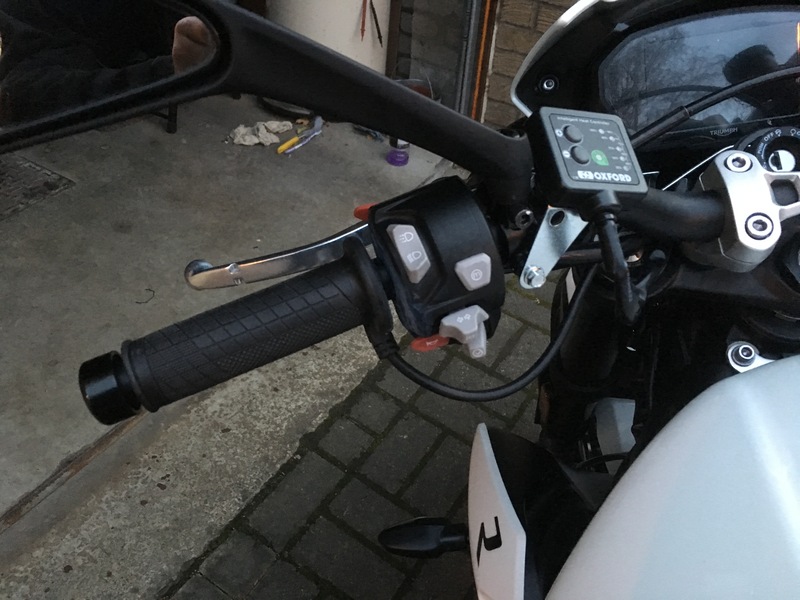 Had a quick run on the bike today and realised that the position I installed the left hand grip meant that cable exit on the grip was obstructing the clutch lever preventing full travel, so I had to break the super glue and rotate to the position shown in the photo. I might see how it works out with the cable running over the clutch lever but suspect it might interfere with the dip/full beam switch. Also realised that the brake light is on permanently - suspect I have pinched the front brake switch cable under the airbox, so will have to investigate tomorrow. I changed grips too what a nightmare I used a sanding wheel on a dremel tool took a 1/2 to get it right. It made quite a mess on the floor doing it next time I'd grind over a garbage can. Your install looks clean though nice write up too. Also, any chance someone has measured? The grips I wanted to get are Domino Strada's, which are for 7/8 handlebar and 124mm long, with open ends. Just to answer my own question, yes, you do have to go through all this. But also: yes; thanks for writing this up. I was reading on the other thread about the Triumph heated grips that they had to flash the firmware to activate the highest heat mode. Had this been done in April, or is that a more recent development? I ask because I'd rather pay the $$$ for the Triumph model and not have to go through all this, but I won't waste the money if it's not going to keep my hands warm.